1) While there was an apparent mistake by ARIN, guess what? OVH should have ordered IPs with sufficient lead time, to ensure that they were delivered on time -- even with a few hiccups along the way. No well organized company, physical or otherwise, times things with the assumption that absolutely nothing will go wrong in delivery. You order ahead of time. That way, when delays like this happen, you aren't against the wall. 2) Others in this thread are right, communication is key. 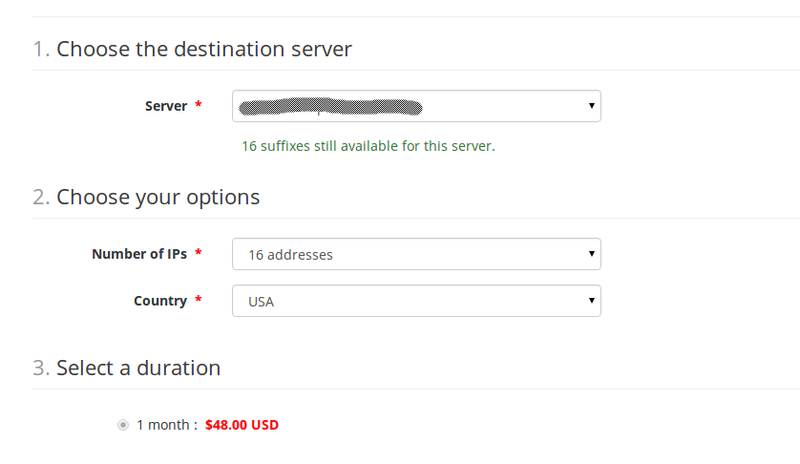 It is so very, very easy and cheap to place a warning in red, such as "Warning: temporary delay from ARIN" when ordering IPs or servers. This isn't 1910, and you don't have to spend money to put up a physical poster. The cost of adding that warning message is cheap, easy to do, and quick. Any suggestion otherwise is disingenuous. There is zero cause to not have done this. Zero. 3 ) No one gets to pass the buck. When you agree to deliver services, you agree. Every single court case in the Western world, has entrenched the concept that when you agree to terms, you're liable. That's because all customers have an agreement with OVH, and not ARIN. OVH has to deal with ARIN, and only OVH can handle that relationship. Even force majeure would not cover a circumstance, such as "OVH did not provide for sufficient lead time when ordering IPs, in case of a delivery issue.". It won't wash when delivering oil in a timely manner to a customer, and it won't wash when telling people that IPs will be delivered in a certain timeframe -- and aren't. Long story short, OVH did not handle this well. They could handle this well, starting this second, by taking a few seconds to inform new customers of delivery shortages. Something I might add, would be a *very* good idea legally. Still the question remains, why does OVH continue to propose servers/vps whereas they perfectly know they can't deliver them because of this shortage of IPs ?! I am sorry, call it whatever you want, but this is dishonest behavior to cash the money, when you know you will not deliver behind. Especially, since this is now a problem which is lasting since weeks. And why http://travaux.ovh.net/ isnt't reporting this issue? And why two different speeches? OVH says this is due to shortage of IPs, and Octave Klaba on twitter says they are running out of space (until BH3 is turned on). I haven't put my order in yet for new IP's to get some of my gaming servers off shared IP's. But I do have to agree with some of the comments being posted. While SYS and OVH wait for a new batch of IP's; they should disable the ordering page for IP's and place a notice saying that they are waiting on IP's to come available. I however don't expect an ETA on when to expect IP's as it not in their hands so they can't know when. ARIN made an error when issuing the IP block to OVH. It is expected they will get the block from ARIN on Monday, this info is directly from an OVH staff member. We are deeply sorry for the delay with the VPS deliveries. Our provider, ARIN, as now given us an ETA for the beginning of next week.The IPs should be there by 1st or 2nd of september. We understand that as you ordered the VPS you expect to get them as fast as we usually provide them and we hope to deliver those VPS as soon as possible. Yes is it about VPS, but the same issue is happening across different product lines. "For the price of the servers, you really can not complain. You will not find any other provider with the hardware and network that KS/SYS/OVH offers." Of course you CAN complain and SHOULD. Just because a price is inexpensive it does not give a vendor a "pass" on delivering what they are selling. If they advertise it, the should deliver it, plain and simple. Quite right, ... however, when you place your order, how can someone know, OVH ran out of IPs ? This is not written on their site, so it's easy to blame the customer who didn't have a ball of crystal to guess it. Simply put, I don't trust their ETA's at this point. And yes, I have called once earlier this week, but it is not my job to badger them. I would hope they would keep us informed as to the status, not me to chase them down. To put it another way, I would not have ordered another server if I knew they were having allocation issues. All hosting companies all have the same issues these days when it comes to getting new IP's due to the world wide shortage. They can only work as fast as ARIN will allow them. No one has forced you to use their services. I can bet you they either don't have any answers yet from ARIN, or they are slowly getting to all the back log of server deliveries and IP orders. For the price of the servers, you really can not complain. You will not find any other provider with the hardware and network that KS/SYS/OVH offers. As it has been mentioned before, it is out of their hands at this point while they wait for ARIN. Have you tried calling them to inquire on the status of the ARIN IP blocks? Well darn. It is now the end of the week, and I have heard nothing since my initial email about a time frame (early this week, and middle of the week according this thread). This is getting frustrating. A whole work week lost so far.. Okay, I checked with support and they say that basically it just hasn't been changed on that page yet, it's just the one time activation fee. Okay, that helps a lot. The only issue is I went to get the IPs and they say monthly on them. You pay a one time setup fee of $3 (per ip) for the first 16 IP's with no renewals. If you exceed the 16 IP's as allowed up to 128, you would pay $3 setup AND $3 monthly for anything over the 16 IP's. On a side note about the IP's, you have to remember that the SYS brand is in HIGH demand. Also with the free IP offerings on the OVH line and now the SYS line they have used up a lot of IP's with these packages. I'm confused, so do I actually have to PAY for my FREE IP addresses? Can somebody tell me how I would actually provision these if they were there? I can't even see how to do that. We are currently experiencing provisioning issues with IPv4 addresses. We have ordered IPs from ARIN and we should be getting them by the beginning of this week. I would like to apologize for this inconvenience. We're doing our best to provide you with your service in the best delay! Now I have ordered a server that is useless to me until I receive the failover IP addresses (need to setup a virtual router on ESXi). I am upset to say the least. Yes, me too . . .added to it I may have to pay another month on another server that I am trying to move from. 1. Tell me when IPs are expected to be available. 2. How I provision them when they are. Will 16 slots show in the management panel? We are currently experiencing provisioning issues with IPv4 addresses. We have ordered IPs from ARIN and we should be getting them by the middle of this week. I would like to apologize for this inconvenience. We're doing our best to provide you with your service in the best delay. If you need anything else please feel free to contact us by telephone or support ticket. the Ips need them urgently.